Foundation walls are under constant siege. Every moment of every day, they are under pressure from the surrounding soil, which is constantly expanding and contracting in response to changes in moisture and temperature. Depending on the type of wall — poured concrete or concrete block — this pressure can affect your basement walls in different ways that require different solutions. DBS can install WallDefense brackets to help permanently protect your home's foundation walls. Call 1-855-259-9625 or contact us online today to schedule a free, no-obligation inspection and estimate. 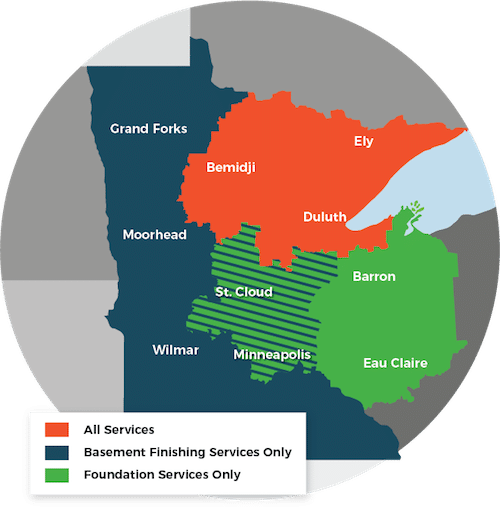 We offer WallDefense and our other foundation repair products in Duluth, Superior, Minneapolis and surrounding areas in Minnesota and Wisconsin.